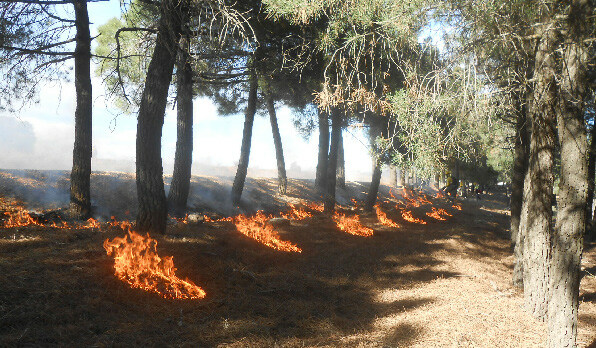 Planned burning is undertaken in Albacete, east-central Spain. There is a growing awareness about the importance of pyrodiversity to sustaining biodiversity. All around the world fire is profoundly influencing people, climate and ecosystems. The impacts of this interaction are likely to increase with rising global temperatures, and there are growing calls to use our knowledge of the connection between fire and biodiversity more effectively. Many plants and animals need fire for their survival, yet even in fire-prone areas, some species are sensitive to fire. How then, can a fire regime support the conservation of species with different requirements? Our new paper in the magazine Science shows how researchers and fire managers are confronting this challenge in a rapidly changing world (Kelly & Brotons 2017). Variation in the time between fires, their severity, size and patchiness is called ‘pyrodiversity’. Because plants and animals often depend on resources that vary as a result of fire, it is argued that pyrodiversity will produce a diversity of habitats that can support more species. It’s an idea that has been discussed for some time but is only now being tested at large scales. Morgan Tingley & colleagues (2016) recently tested this hypothesis in a study of how variation in fires shapes bird diversity in conifer forests in California. They collected more than 38,000 observations of birds from a total of 97 fires, and showed that different burn severities created unique habitats at local and regional scales, including areas with low and high cover of trees. Bird diversity was higher in places that had experienced fires with greater variation in burn severity; this effect increased in the decade after fire. In another recent study, Lauren Ponisio & colleagues (2016) collected more than 7000 pollinator specimens at sites that differed in past fire intervals and burn severities in conifer forests of Yosemite National Park, California. Diversity of both pollinators and plants was higher in areas with higher variation in fire interval and severity. 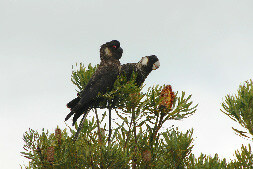 Studies on the endangered Carnaby’s black-cockatoo (in Western Australia) have shown their continued presence in the landscape will require a good understanding of fire regime. 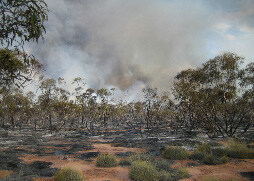 Researchers have shown they need large areas of native woodland burned with less frequency. However, just because increasing variation in fire regimes can lead to higher biodiversity in some circumstance, it doesn’t necessarily mean it always will. For example, work we have done with colleagues in Australia found that in semi-arid eucalypt woodlands the diversity of birds was not correlated with increasing spatial variation in pyrodiversity (Kelly et al, 2016). This was because long-unburnt vegetation provided disproportionately important habitat and critical food and shelter resources such as large trees. 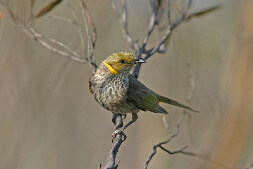 Similarly, Laurence Berry & colleagues (2015) found that large patches of long-unburnt eucalypt woodland have particularly high levels of bird diversity. The authors suggested that bird diversity would benefit from preservation of large, continuous areas of habitat rather than the creation of small unburnt patches. Taken together, these recent studies suggest that it is important to consider how fire influences both the diversity and area of suitable habitat across a suite of species. Through studies such as these, we can begin to define desirable ranges of variation for multiple characteristics of fires, tailored to support particular ecosystems and species. But fire and biodiversity cannot be understood in isolation from other drivers of environmental change. Climate models forecast widespread increases in fire frequency and intensity because of rising global temperatures. Urbanization in southern Australia and western USA, regrowth of forests on abandoned land in Europe’s northern Mediterranean, deforestation in tropical South America and Asia, and invasive plants in South Africa are all radically modifying fire regimes and biodiversity. Developments in fire ecology provide new ways to link models of animal and plant responses to fire with landscape simulations and scenario analyses to predict biodiversity change in these complex landscapes. These tools and approaches are increasingly being put to work by land managers and policy-makers. For example, new approaches we have developed that link species distribution models, biodiversity indices and numerical optimisation are already being used across large parts of southern Australia, such as in Murray Sunset National Park, to ensure that fire regimes benefit biodiversity. Another practical management challenge lies in uncertainty about biodiversity responses to fire. 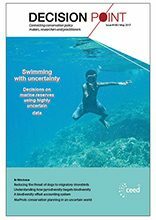 Progress in the development of models and decision tools is also helping to make better choices about when and where to conduct planned burning and fire suppression, while considering uncertainties such as the occurrence of wildfires and droughts. Fire management will be strengthened by adaptive approaches that are underpinned by experimental manipulation of alternative fire regimes and decision frameworks involving ongoing research, monitoring, and evaluation. A surge of new work has advanced knowledge of how spatial and temporal variation of fire influences biodiversity but there is a need to further develop approaches that are better tailored to local conditions (while still being supported by ecological theory). Now, more than ever, understanding of animal and plant responses to fire should be used to determine fire management objectives and actions. Berry LE, DB Lindenmayer & DA Driscoll (2015). Large unburnt areas, not small unburnt patches, are needed to conserve avian diversity in fire-prone landscapes. J. Appl. Ecol. 52: 486-495. Ponisio LC, K Wilkin, L M’Gonigle, K Kulhanek, L Cook, R Thorp, T Griswold & C Kremen (2016). Pyrodiversity begets plant-pollinator community biodiversity, Global Change Biology 22(5):1794–1808.